A hypnotic fragrance that swirls in waves of decadent flora. 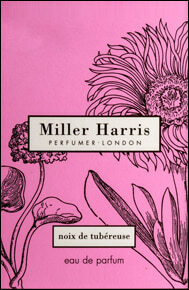 Miller Harris Noix de Tubereuse is the scent of woodland at dusk: of plants and roots, ripe fruits, a trace of pollen on the wind. The fragrance celebrates the beauty of the intense tuberose bloom, a complex and enveloping flower that structures the entire composition. Touches of powdery violet and creamy tonka bean in the dry down makes for a sweetly sensual scent.